Dr. Vivek Mittal is an experienced and accomplished surgeon . He has been in the field of Orthopedics since the past 25 years.Dr. Vivek Mittal is well known in the field of Primary and Revision Joint Replacement Surgery of the hip, knee and shoulder joints, besides complex trauma surgeries. 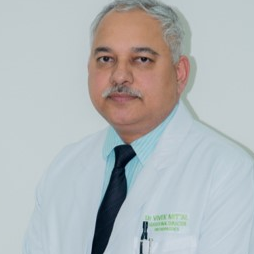 Dr. Vivek Mittal has performed over 10000 surgeries including over 4000 Joint replacement surgeries including Primary, Complex Primary, Infected and Revision total knee replacement (TKR), total hip replacement (THR). In addition he also performs Shoulder replacement, Osteotomy around the knee for early arthritis or deformity of bone and Complex Trauma Management based on AO principles especially around the hip, knee and shoulder joint. Dr. Vivek Mittal is a graduate (M.B.B.S) from University College of Medical Sciences, Delhi University, and Post-graduate (M.S. in Orthopedics) from Safdarjung Hospital, Delhi University. Dr Mittal is one of the best orthopaedic surgeons with an experience of over 23 years. Dr Mittal is one of the best orthopaedic surgeons with an experience of over 25 years. He has worked with Delhi Institute of Trauma & Orthopedics, Sant Parmanand Hospital, St. Stephen’s Hospital, Jeewan (Mala) Hospital. Delhi Orthopedic Association Indian. Orthopedic Association Delhi. Medical Association of Spine Surgeons of India. M.B.B.S., University of Delhi. Post Graduate Orthopaedic training , M.S. (Orthopaedics), University of Delhi. Frozen shoulder – Is shoulder replacement the only option?